I’ve looked at the Woodlore knife for many years and loved the craftsmanship that’s gone into it. I also saw the episode of Ray in Julius Pettersson‘s forge, while he was making a knife. When I saw the Hand Forged Knife Blade listed on Woodlore’s shop I wanted the chance to make my own knife to try out some skills and hopefully do justice to it. I’d had a go with a knife kit before and this was very rewarding but I knew I could do better. I found a block of stabilised curly birch on the internet and some buffalo horn and bone spacers used in stick making on another site. I drilled a series of small holes through the bone spacer to make the bolster, then used a set of needle files to open up a hole to suit the tang of the knife and the get a close fit. Various grades of sand paper and wet & dry were used to get the top surface flat and polished. I’d learned to do this now as it’s impossible once the knife is put together. A small square of leather was then cut and placed behind this. The wood block was the most difficult part, as a hole big enough to accept the tang was drilled down the entire length which is tricky to keep straight with only a vice and a hand drill. This again was filed to suit for a good fit. Another leather spacer was added and the horn pommel was drilled, filed, polished and fitted. With all the parts finished and dry fitted it was time to glue everything together and peen over the top of the tang to hold it all in place. Then the minor job of sawing off excess material and a lot of wood filing and sanding to get a handle the shape I wanted. 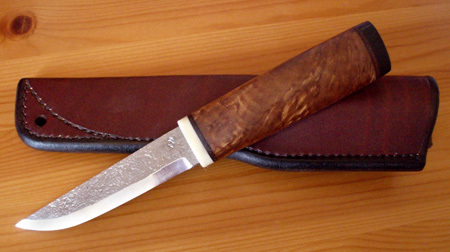 There was no chance of making a sheath to such high standards as the Woodlore sheath, so I bought one with the blade. Woodlore were so helpful, as I wanted a left handed version, which they happily had made up. My last words of advice are to wrap the blade well before you start working with it; one – to protect the finish of this wonderful piece of craftsmanship and two – more importantly – to protect your fingers from the razor sharp edge. This entry was posted in Bushcraft Clothing & Equipment, Bushcraft Tips & Guides, Customer Posts on November 26, 2010 by Woodlore Team. 1). How do you cut the pieces cleanly? My initial thought was a band saw but I have not got acces to one. 2). How to finish it off? What do you hammer down to hold it together? Speedy replies would be much appreciated and any other tips that may be helpful. That’s a beautiful knife Martin, and glad you had fun making it. The Sweden episode of “Bushcraft” with Julius Pettersson, started my interest in Scandinavian knife making, particularly hand forging the stick tang blades.